I’m sorry (no, I’m not). So HEY pictured in that comic is my new tablet! My wonderful and amazing wife bought me a Wacom Cintiq for my birthday (which was last Monday on the 7th!) and THIS IS WHAT I DO WITH IT. Then again she reads my twitter feed and hasn’t run away screaming yet so I guess it was to be expected at some point. Big ups to my very good buddy Dann (of Super Art Fight, and also of his brand new comic Iron and Blood) for providing the Cintiq for an amazing price as well! SPEAKING OF SUPER ART FIGHT. I will be at AwesomeCon in Washington DC this weekend, April 18th-20th, tabling alongside another SAF member, Peet Sketches at table J7! He’s also got his own comic! Here’s a handy dandy map to help you find where I’ll be! 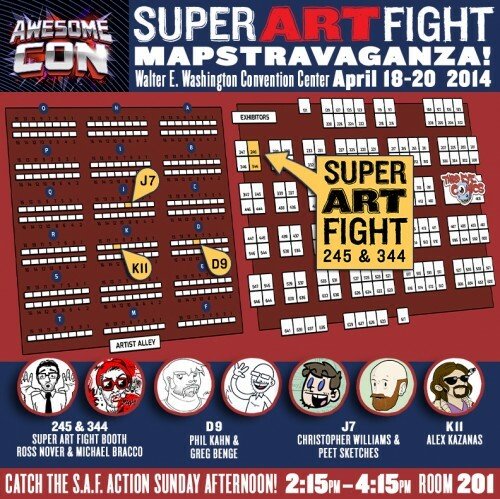 And then catch me on Sunday at the SAF show from 2:15-4:15, doing some actual Art Fighting! Hooray! YAY. Talk to everyone soon!